Sign-up using the form or call your nearest store to take advantage of this exclusive offer. *Some restrictions apply. Call for details. Finding a great looking eyeglass frame can be tough work. What looks good on you? Should you go with round lenses, or square? What should your frame be made out of? Choosing the material of your eyeglass frame is the first order of business, since that will narrow down your search to one specific category. Semi-rimless frames are quite popular, and feature a "clear looking" bottom half of the lens. The lens is mounted in the metal top half of the frame with a very thin metal or plastic monofilament that holds the lens in place. A full rimless frame, also called a "drill mount" features temples and a bridge that are mounted directly into the lenses. The bridge and the temples can be made from metal, or a hybrid of metal and plastic. Flexible frames are becoming more popular among athletes and children, because their titanium based material allows the frame to bend and flex without breaking. Who Shouldn't Wear Metal Frames? All metal frames have nose pieces that lift the frame off the bridge of the nose and provide support for the frame. Some individuals do not like the feel of nose pieces, especially those who have stronger prescriptions and thus thicker and heavier lenses. Additionally, some individuals are allergic to the metal used and may break out if the metal touches their skin. 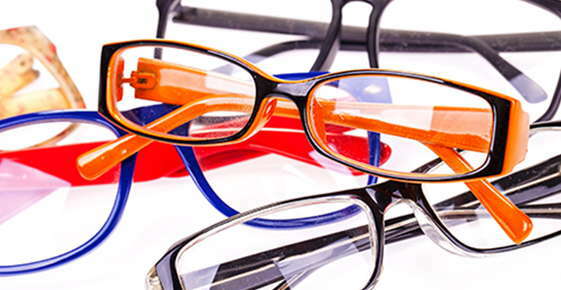 Plastic frames are the second major material for eyeglass frames, and are as equally popular as metal. Plastic frames can be thick or thin, and can be made in a broad range of colors. Plastic frames must be adjusted by using heat in order to soften the material and allow malleability. Zyl, also known as cellulose acetate, is a lightweight but strong material used for the majority of plastic frames. Laminated zyl frames can have a layered color look, or traditional zyl can be made in bolder, darker colors like black and brown. Who Shouldn't Wear Plastic Frames? Most anyone can wear plastic frames, however, individuals with stronger prescriptions and thicker lenses may notice that plastic frames are quite heavy and cumbersome. Before you choose what material you'd like for your frame, visit an eye care professional and try on several different styles. Take note of the feel of each frame in addition to how it looks, and don't be afraid to ask about the different options available to you.